SpectraFoo provides all of the tools today’s audio projects demand. Whether you are a live sound engineer or a studio mixer, you need the power of SpectraFoo.SpectraFoo is a collection of award-winning high resolution metering tools. ‘SpectraFoo can analyze up to 24 channels of audio simultaneously, and features a completely flexible workspace. Place any combination of instruments wherever you want, link their controls and save a windowset to have instant access to your workspace. Create windowsets for live mixing, mastering, studio recording or benchtesting gear and recall them with a keystroke. 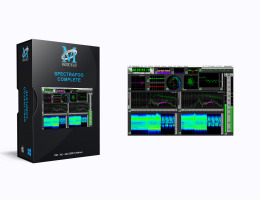 With standards-based level metering, high-speed high-resolution spectral analysis, the unique PhaseTorch, correlation metering, triggerable waveform display, power balance and a variety of power, envelope and spectral histories and phase analysis, the SpectraFoo product family is absolutely essential for broadcast production and critical mixing and mastering. SpectraFoo Standard includes basic, sample-accurate metering, triggerable waveform display, power balancing and phase analysis on any number of input or output channels. Get The SpectraFoo Trial Here!